to create rich novels sure to draw you in. As Italy tries to heal from the wounds of World War I, one young woman brings together a number of strangers from disparate sections of the struggling country’s society. Isabella Roselli has an inner strength that defies understanding and her mission will touch those still hurting from the scars of war and injustice. When the orphaned Isabella happens on the Martellino vineyard, she pulls in a widowed mother of four, a shell-shocked soldier, and an imperious matriarch. As these and other characters in the town of Lucca get to know Isabella, they are challenged to surrender their fears. Fascism is taking hold of the heart of Italy, and it is ensnaring all Italians in a web of brutality and dictatorship. Will Isabella’s simple love and friendship be enough to break Fascism's hold on the residents of the vineyard? Find out in this compelling novel about love, hope, and the family we choose for ourselves. 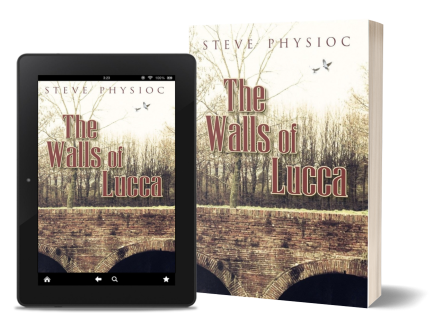 The sequel to The Walls of Lucca, Above the Walls follows the Martellinos and their workers as World War II approaches. Love, deception and faith intertwine with the heartbreaking ravages of war in this gripping family drama. Mussolini has joined forces with Hitler, bringing Italy closer to the brink of war with each passing day, and evil politician Alfredo Obizzi has wasted no time in seizing power and fortune as Fascism envelops Italy. Using his growing power, he is determined to ruin the families who have kept him from rising in the Fascist ranks, the Martellinos and the Carollos, along with the vineyard that sustains them. Will the families be able to save the vineyard — and themselves — from the evils of war and Obizzi? Find out in this epic story of the battle between vengeance and forgiveness.